Why are clean drains important? Keeping your drains clean can help save you money each year in repair bills to your plumbing system. Neglected drains can quickly lead to the loss in integrity of the pipes, resulting in a break that could cause a major inconvenience for the homeowner. 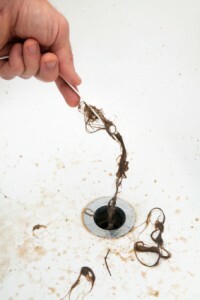 Our plumbers can inform you of the reasons why it is so important to keep your drains clean. This is an important step to take if you don’t want to deal with clogged drains. One of the most common causes of a clogged drain begins right in the kitchen. Whether you own a garbage disposal or not, food particles can easily make their way down the drain, where over time they get trapped in certain areas. As the clogged food attracts more particles, it makes it difficult for the water to make its way down the drain. Slow draining sinks are the first sign of trouble, and if you allow the clog to remain, it could affect the way your garbage disposal functions. Our plumbers will clean your pipes and make certain all the debris is flushed away. When a drain is clogged, many homeowners purchase over the counter drain cleaning chemicals. Many of these products are not effective, the one thing they can do is deteriorate the drain pipe. When the chemicals remains trapped in the drain, they wear away the pipe from the inside, breaking down the strength of the pipe over time. The drains in your shower probably get the most abuse through the year. Every day the soap residue, hair, and dirt all travel down the drain with the water. Many times chunks of soap make their way down the drain and become lodged in the pipe. As more debris and contaminants come in contact with the soap, it acts like a magnet attracting debris to that area. Our drain cleaning technicians will get to the clog and free it from the drain so the water can flow freely once again. Are you in need of a drain cleaning service call in the Annapolis area? Call Heidler, Inc. at (410) 268-7191 and schedule a service call with one of our plumbers today!